I'm getting my hair dyed today -- long overdue, which it always is. I can't afford to get my grays covered every five to six weeks as recommended, not at my stylist's rates. My old skunk stripe is where my very first gray hairs appeared -- and since that's my Grey Hair Ground Zero, that same area is now the most resistant to hair dye. The hair in that stripe is now not just gray, but an alarming shade of snowy white. Barn owl white. I wear my hair parted so that, even when I'm overdue for a touch-up, you can't easily see the stripe. But when I look for it -- yikes! There it is. Not going anywhere, honey. 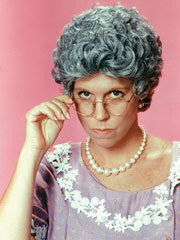 Finding my very first gray hairs didn't make me feel old -- not when I was still too young to buy alcohol. But hearing my stylist tell me that she now needs to whip up a special small batch of heavy-duty dye for my color-resistant stripe: yes, that makes me feel old. Also: when she tells me that my natural hair is now almost 40% gray. What? But what I really want to talk about with my stylist today as she's applying that heavy-duty dye, is my cut. Forget about the gray hairs. Right now, my haircut is making me feel old. It's worth a whole other post, how I came to cut my curly hair short, how a lovely woman I saw one night three years ago led me on a quest to copy her chic, short, adorable cut. Because when you get me going on the subject of my impossibly thick, coarse, very curly hair, I have a lot to say. A lifetime of stories and experiences and humiliations to share. So let's just say this: I used to wear my hair long-ish. Below my shoulders, anyway. It was heavy and droopy and hid my face and I wore it up in a headache-inducing topknot much of the time. Also: the frizz. Yeah. Like Mama. And don't forget, I also wear glasses 75% of the time. 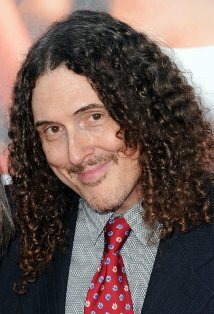 Weird Al and his lovely locks. Oh, DITTO on the gray hair. And the short hair. My grays showed up mid-twenties. I have great wings of gray streaking back from my temples and peeking through at my hairline. I am now starting to feel like those old ladies who have dark hair but put in blonde highlights to hide the grays. I am actually thinking of cutting my hair short again. Do you subscribe to the no-shampoo method of taming curly hair?